Yesterday we reported that Uganda's Constitutional Court heard a petition challenging the country's Anti-Homosexuality Act. 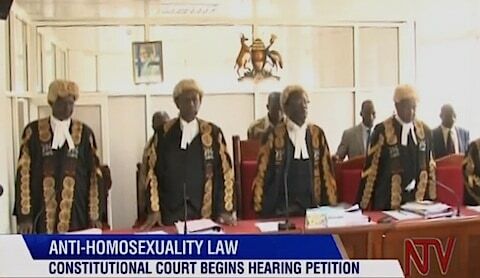 Uganda's NTV network reported on the proceedings and uploaded the segment to YouTube. Judges have adjourned the hearings until Friday, when they are expected to rule on the quorum issue. Ugandan state lawyers defended the law on Thursday, the second day of the hearings, asking judges to dismiss the petition. "There is no evidence about the quorum," state attorney Patricia Mutesa told the court in the capital, Kampala. But prominent gay-rights activist Frank Mugisha, one of the petitioners, said he was optimistic that judges would rule in favour of scrapping the law. "I think that we could have a very good judgment tomorrow, and if we get that judgment then it's over – and we just have to celebrate," said Mugisha, who heads the Sexual Minorities Uganda group. Anti-gay preacher Martin Ssempa, who was also in court, said he feared the "judicial abortion of our bill" due to international pressure.